I'm using LeapDroid for some time now with the bot and it's running very good. Just need to be careful in docked mode with the mouse... if you click, move and release the mouse outside the android client area, the mouse will "break" and manual reboot of LeapDroid likely required. Also, LeapDroid has a very bad behavior bringing the window to front very often. This steals the focus and is very annoying when you try to use the PC while botting. Another super terrible behavior of LeapDroid is that it constantly tampers with the clipboard when images or related objects have been copied into it. LeapDroid replaces / removes those with "(" character !!! 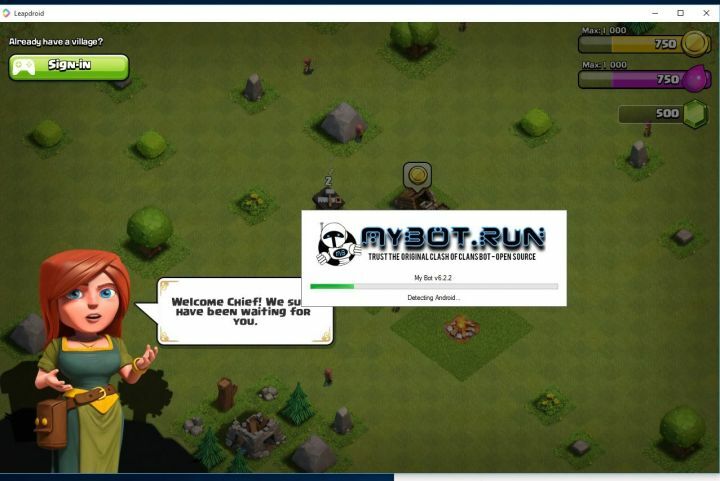 It is not advised to run BlueStacks and LeapDroid with MyBot.run as ADB connections are difficult to get established for LeapDroid. 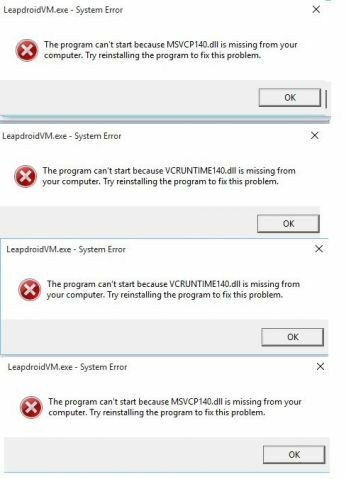 Also, default LeapDroid ADB device name is emulator-5554 for instance vm1 and same as BlueStacks which causes MyBot.run problems. Updated download links to qt4 libraries. LeapDroid has been purchased by Google, and has announced there will be no more updates and they are discontinuing all software support. We have no control on this new business development and it may force MBR to stop supporting LeapDroid at some time in future. But: MBR will continue to support current versions already supported while it remains possible. Added download links of latest original & untouched LeapDroid installation files. Updated post about clipboard issue. LeapDroid 1.8.0 support by MyBot.run 6.2.2, automatic screen adjustment fixed in next release. New LeapDroid 1.8.0 not yet tested. outside bot window when used for LeapDroid, mouse handling inside LeapDroid stops working, so be careful! ADB connection problems when mixed with other Emulators. Work-a-round: Close all LeadDroid instances at start bot again. As of version 1.5.0 only vm1 and vm2 support keyboard input, version 1.7.0 has that fixed. 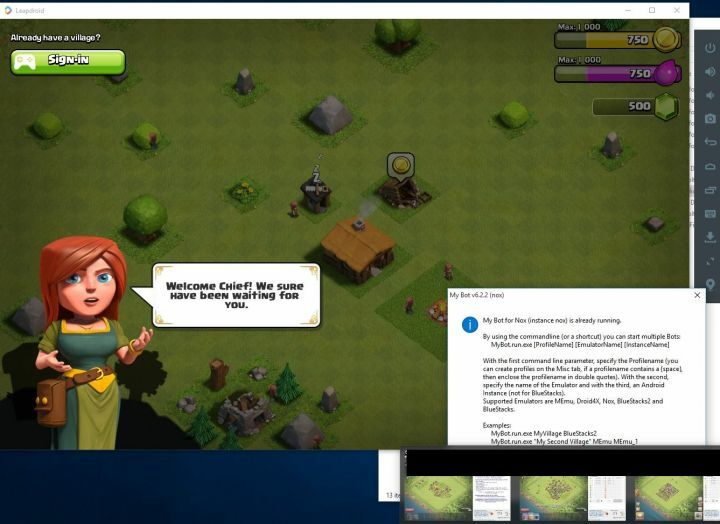 Installation of BlueStacks and LeapDroid at the same time is not advised, as LeapDroid ADB device name is same as BlueStacks. You are missing some Microsoft runtimes like 2008 and stuff like that, Google "all in one runtimes" you can choose all runtimes there so that you don't have to download and run them by yourself. download and install this https://www.microsoft.com/en-us/download/details.aspx?id=48145 and it will fix your problem. well i use all Android Emulator they work as well but still when all bot working my new bot cant find the leap what should i do? to fix this i use leapdroid ver 1.5 should i down load higher version? bot can find my Emulator? I've tried with CMD method to launch two instances of LeapDroid but with no success. Can someone lighten me a little? 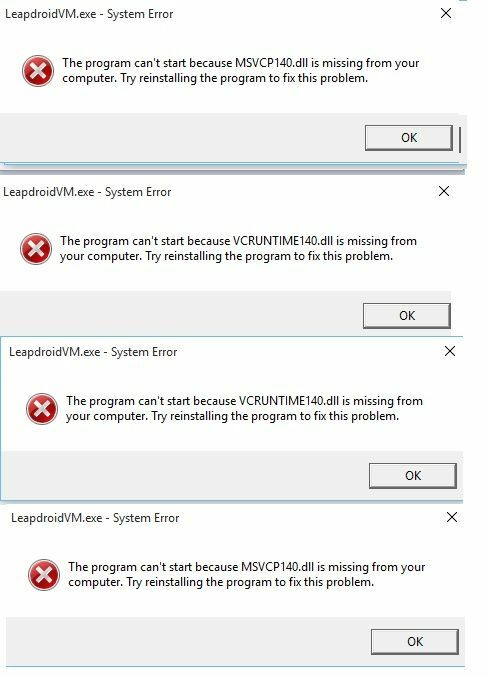 I used " mybot.run.exe 01 LeapDroid" for my first instance and it is working fine, bur everything I tried for the second one is not working and it shows that "instance is already running"
im boting easy now but somting worng after 15 + 20 min some time s more leapdriod get a some random error ucant click on anythink in game and you must reset full leapdroid any idiea what i do? even bot cant click any think but can zoom out.